LIGHTWEIGHT AND DURABLE CONSTRUCTION - Constructed with 10 nickel plated chrome vanadium tools held together by two anodized aluminum sidebars. Weighs only 118g. Much higher quality then the plastic and cheap steel models on the market. SEVEN SIZES OF HEX WRENCHES - Hex wrenched are the most common tools used to adjust and repair bicycles. Be prepared to make needed seat post and handlebar adjustments, tighten loose water bottle cages and re-attach loose accessories. Includes the following sizes of Hex keys: #2, 2.5, 3, 4, 5, 6, and 8. TWO SCREWDRIVERS - Many bicycles require Philips and flat head screwdrivers to make certain adjustments. Most notable are the stop screw adjustments on both the front and rear derailleurs. Included is a #2 Phillips, and #5 Flathead. 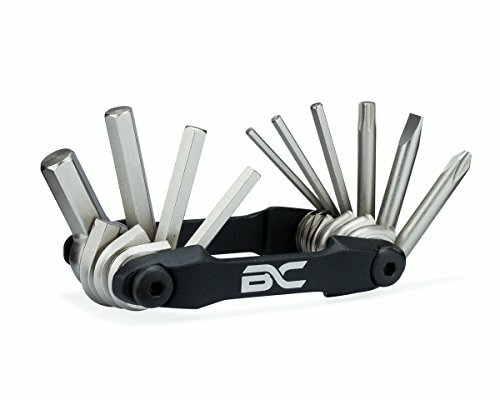 If you have any questions about this product by BC Bicycle Company, contact us by completing and submitting the form below. If you are looking for a specif part number, please include it with your message.